Those big snow drifts aren’t only hard on your snowblower, a Department of Natural Resources biologist says he’s afraid they are also going to take a toll on the state’s top game bird. 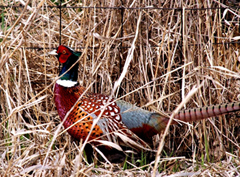 Todd Bogenschutz says the recent blizzard wasn’t what pheasants needed. He says any storm of this magnitude has the potential to harm the birds, and he says with the bird numbers low coming into the winter, things haven’t gotten off to a good start. Bogenschutz says big storms have multiple impacts on the pheasants. Bogenschutz says some birds probably died as they got buried by the snow, or suffered hypothermia. He says the snow also blows in and fills up the bird habitat, which is also a concern. Bogenschutz says the birds might have had some protection in areas where there was still corn standing. He says that’s especially the case in south-central Iowa, where a lot of corn was still standing. Bogenschutz says the corn provides cover and food for the birds. He says a lot of corn was harvested before the recent storm, so the overall impact of the standing corn will not be big for the birds. Bogenschutz says he’s heard the hunting this year has been spotty already as bird numbers are down after the above normal snowfall last year and the wet spring. Bogenschutz says more rough weather and snow the rest of this winter could compound the problem.